USAID is supporting a rigorous impact evaluation (IE) of the LAND project intervention in Afar to measure the key development impacts of project activities on communities and households related to enhancements in community resource governance, tenure security, climate resilience, and livelihoods. The IE will utilize a Difference-in-Difference methodology to measure impact, using baseline and endline evaluation data to compare changes over time between communities in Afar receiving the LAND intervention and communities in Afar that are not receiving the LAND intervention. Comprehensive quantitative and qualitative baseline data was collected prior to the start of LAND activities from March to June 2016. The IE data collection instruments were designed to collect information on the conditions of grazing areas and water points, tenure security and access to grazing areas and water points, and natural resource governance. A Baseline Report, Design Report and other materials have been drafted and are available on this page. 50 Participatory Mapping Exercises, with herders and scouts. Baseline findings on the conditions of grazing areas and water points show that the conditions of both wet and dry season grazing areas in the study area are deteriorating due to consisted drought and the encroachment of invasive bush species. Baseline findings on governance in the study area indicate that customary leaders are primarily responsible for allocating land, setting and enforcing rules about land management, resolving conflicts, and decision-making regarding customary land use and management. 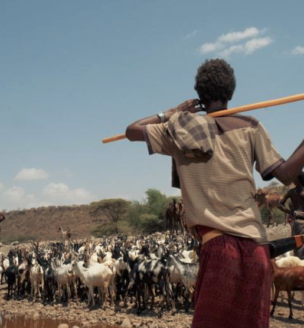 Nonetheless, local expressions regarding governance reveal a perceived shift in the power and role of customary leaders over land use and rangeland management to formal government officials. In terms of tenure security, baseline findings on the threat of encroachment and risk of land reallocation of grazing areas indicate that respondents generally feel their land use and access rights are secure.